A few words from Buzard Pipe Organ Builders concerning the Jardine chamber organ. This instrument has provided examples of many of the challenges faced by restorers and conservators. The older an organ is, the less certainty there is about details, about what’s truly original, and what may be a later accretion (or subtraction!) To what state does one go back if one cannot be absolutely assured of what “back” was? As is often the case, present needs also dictate details of one’s approach. The structure of this instrument was compromised by a previous owner having sawn the instrument in half across the legs in order to get the instrument into a basement. The top had also been cut down (and pieces discarded) to allow installation in a room with limited ceiling height. The upper front, including the dummy façade pipes, had been poorly stored, leading to almost total disintegration of the original finishes on these parts. The original back had disappeared. 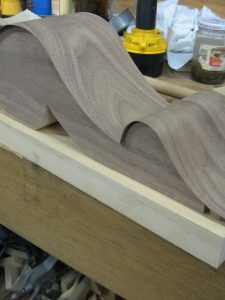 New legs have been made using the same methods and materials as the original, so that the organ is again structurally sound. (The remains of the original legs have been archivally stored.) A new back was fabricated using the same mortise-and-tenon construction as found in the rest of the casework, and finished to match. 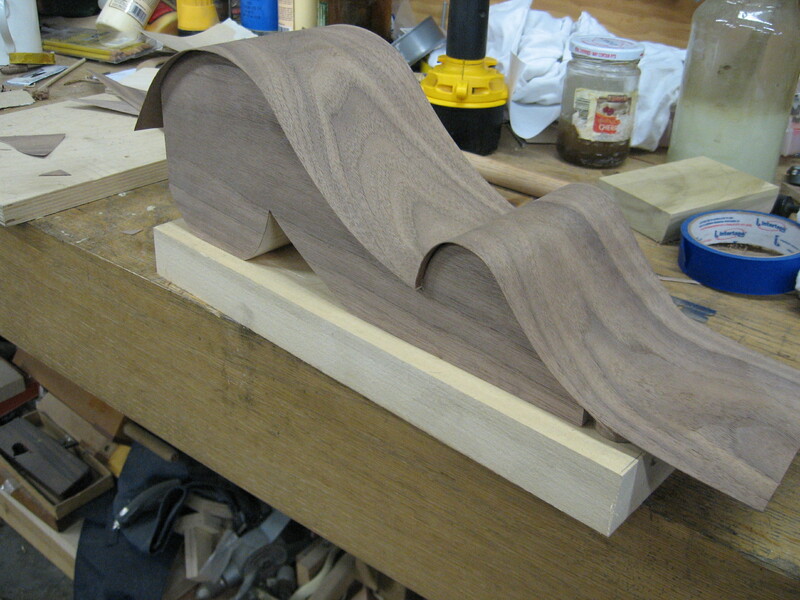 Details of the trim molding on the top front and sides were modeled from pictures of other Jardine organs of the period. No photograph confirming this particular instrument’s original appearance has been discovered. 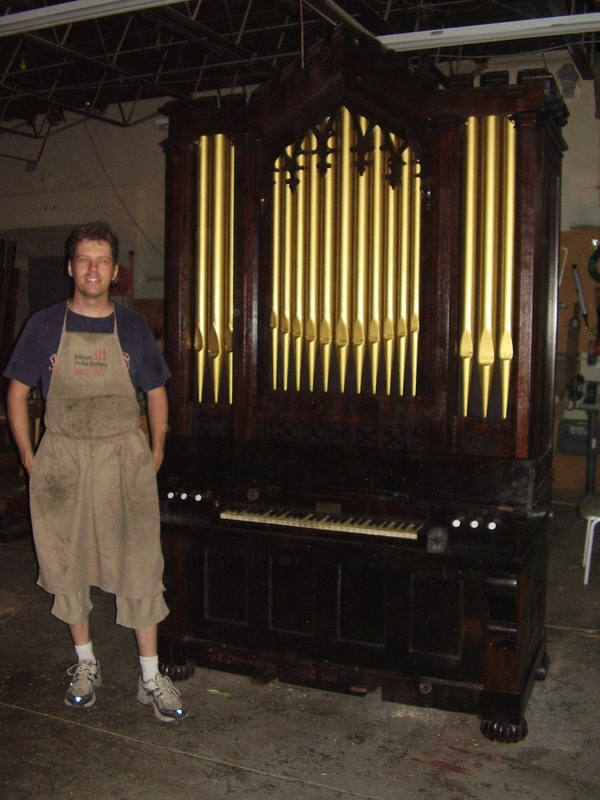 All other known examples of Jardine chamber organs are slightly different in configuration, so reconstruction of top parts of the cabinetry is to some extent conjectural. 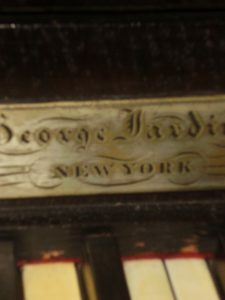 In addition, the current home of the organ has slightly less available height than would be ideal, so newly fabricated upper pieces of the case front and side have been made easily removable. New and replica casework pieces have been finished to match the remaining original material, but have been fastened and/or attached so that it is clear what is our work and what is original (or at least old!) The case front when stripped looked almost like rosewood, which certainly could possibly have been used during this period, but the wood appears somewhat lighter in weight. 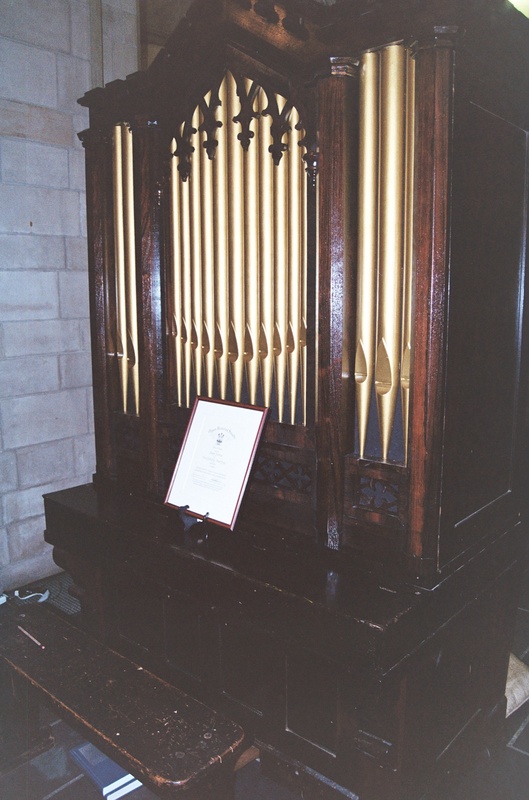 Walnut and walnut veneer have been used in replicating and filling-in; the back is made from salvaged 19th-century pine Bourdon organ pipes. The façade pipes have been lightly sanded (to remove unoriginal top layers of paint) and sealed (retaining what remains of the original finishes below the newly-added top coats.) Consultation with our friend and colleague Marylou Davis, an expert on historic American interior design and frequent consultant to many of us in the organ restoration field, led us to choose an alkyd enamel paint which very closely mirrors the original appearance, as nearly as can be ascertained. At some point in the organ’s life, a crude pull-down pedalboard was added. This resulted in the loss of pieces of the lower front base, as well as loss the original foot-pumping pedal and connecting arm. Installation of this pedalboard had also necessitated removal of the original swell shoe, and installation of a different swell shoe in an extremely awkward position. 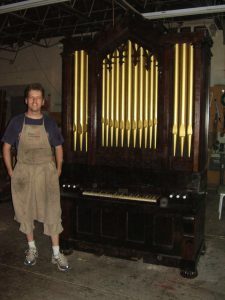 The most recent owner had crafted a unique device to raise the bellows, which in fact was louder than the softer stops on the organ. Examination of screw and bracket holes, as well as wear patterns on the underside of the feeder bellows, clearly showed the location of the original swell pedal and pumping pedal. Internet research (including the indispensable OHS Database http://database.organsociety.org/) as well as the never-failing generosity of colleagues has provided details from similar Jardine organs, including ones in Albany, Texas and Prairieville, AL. Thanks to Jim Stettner and Jim Cook for having posted photos! A new foot-pumping pedal and swell shoe, each in their original positions and closely resembling the originals, now grace the organ. The reservoir and feeder bellows were recovered (in rubber cloth and using modern adhesives!) by a previous owner, but since they are presently airtight these await a future more historically sensitive treatment. 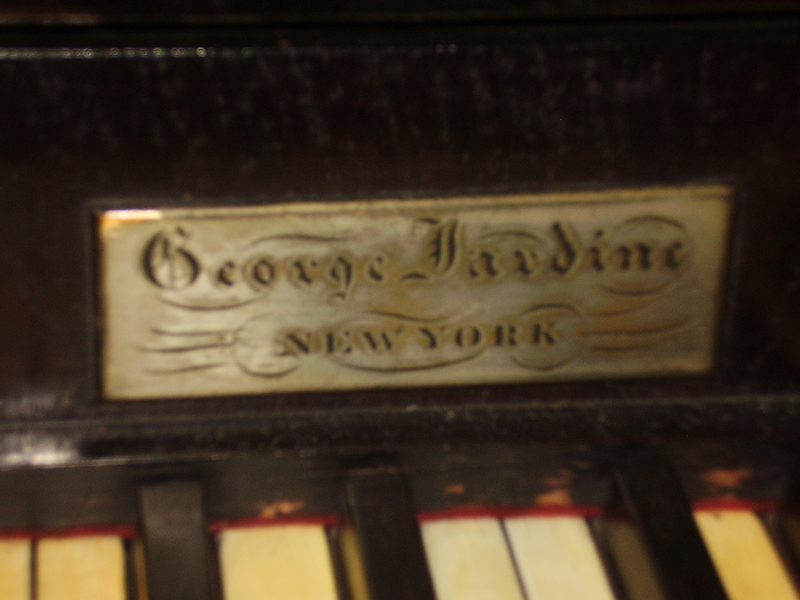 The specification does not exactly match any other extant Jardine instruments, but the pipework appears to all be original. 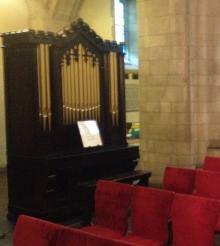 The pipes were fitted with slide tuners at some point; these have been retained. Only one of the drawknob faces is original; replicas in the style of this one await completion at another builders’ shop. We are grateful to the owner for allowing us the opportunity to work on this important unique instrument. This instrument is the oldest American-built pipe organ in the Chicago metropolitan area and is one manual, 3 1/2 ranks. When it was acquired, the façade had been stored outdoors for a long time and was in difficult condition. The lower section of the case had been sawn in tow as well. The Empire-style case has rosewood-veneered woodwork. The roof, back of the case, and much of the ornamentation, particularly at the top of the façade, had been long lost. A 17-note pedalboard of pulldowns from the manual was a later addition and has been removed. 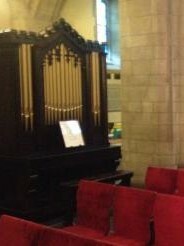 The client wished to display the instrument at the 2012 Organ Historical Society convention in Chicago. Some restorative repairs were done by Trevor Dodd of Battle Creek, Michigan and Buzard Pipe Organ Company was selected to restore the action and create the top of the Façade. David Brown, forman of the Service Department at Buzard, presented the owner with a stunning and historically-informed drawing of how the instrument might have appeared. The organ was presented the Organ Historical Society Historic Organ Citation #387 on 4 January, 2011. The following is a reconstruction of the stoplist as all but one of the original stopknob labels are missing.